There are not many books that I finish reading in one sitting. This was one such book, and the reason is many. 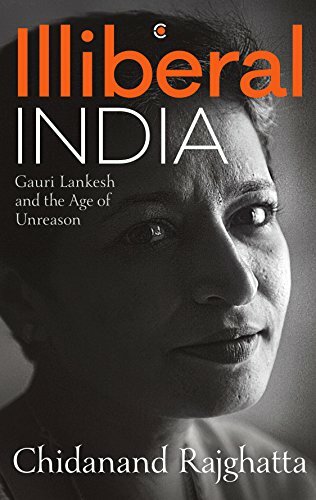 ‘Illiberal India’ – Gauri Lankesh and the Age of Unreason is written by Gauri’s lifelong friend and ex-husband Chidanand Rajghatta (Chidu). I bought it from the fresh books on the stand. I believe it was released in May this year. Just so you know, this is not an “I am Gauri Lankesh” book but it is a “This was Gauri Lankesh” Book. I am sure some would be offended by the title. But it says ‘Illiberal’ India and not ‘intolerant’ India. Not Yet!!…. The importance of the book and the title is that India is still tolerant but if it slips off the liberal path, it won’t take much long for intolerance to sweep through every nook and corner of life. This is the case not just about India, but every other country that hill let go and not take care of liberal thought. And for people taking offense, Well I think it has become the trend now among the religious and non religious camps equally. The world will be a much better place when people stop taking offense. Illiberal India is about Gauri Lankesh, written by someone who knew her best. It is the story of idealism, relationships, advocacy and friendship of two people in the backdrop of the past several decades of socio-political-journo scene. It is about Gauri, the friend, the amazing human being, the activist, the advocate for secularism and the fearless fighter she was. It is a very personal narrative more than anything like a political or social commentary. But when it is about Gauri, probably one cannot detach the two aspects completely. For me personally the fluent easy prose and the knowledge into a lot of what was happening made it such a compelling read. To be honest before reading I did not know much about the Veerashaiva and Lingayat camps and how their existence in different forms impacted the voting nexus. Also how hope idealists bestow on new leaders crumble as they become sucked into the political web in the nation. How everything boils down to winning and vote banks. Above all it is the narrative of the past 30 plus years as Gauri and Chidu agreed, disagreed and yet loved, lived and worked in their chosen field of Journalism. It is also about the need to have the rational thought in life. Personally I also became aware of a lot of literature that I have missed reading. The book touched many a personal chord for me, may be because I lived in Karnataka for a few years, and always have that love for the place. I am from THALASSERY,I enjoy watching your videos on Facebook.